11:30pm Bathroom. Sam and Kyra. Kyra gives Sam a hug. Adam joins them. Adam – did I tell you, you’re beautiful today? Sam – no. Adam – did I tell you that Kyra and I love you. Kyra – yeah, so much. Sam – what? Adam – did I tell you that Kyra and I love you. Kyra – we would actually do anything for you. Sam – I am really trying. Kyra – I am so proud of how you’re holding it together. You’re doing a phenomenal job. I can see the look in your eyes, you want to cry. Sam – when I came and asked if I could chat .. Anthony was like I’ll go and I said no, no both of you (Cory & Anthony). I said that I know that Dane has been running in here after every conversation. First of all if that doesn’t speak volumes to you .. I don’t know what does. I said that I am just here to speak truth.. because I know that its truth against lies at this point. So I never really felt like I was under the gun until right now. And I feel like I have to keep working to remind you of what’s true. I brought him (Anthony) up to speed of the conversation between Dane and I and where the backdoor originated. I said I know that you’re going to trust your gut and that you’re a smart, smart woman. You need to pay attention to not only now but the weeks leading up to this sh*t storm and things that are going to happen after. If I go, the next person they’re going to come after is you. Kyra – he would put up me and Cory. Sam – yeah. Kyra – now I’ve talked to her and opened up the idea. You’ve talked to her. Sam – I said that me and Adam will keep you guys safe. I speak truth in this game. I am loyal. I don’t run to power. And I’ve been honest with you guys. Kyra – and now the bow on top will be Adam confirming that Dane would put up me and Cory. And you’re (Adam) going to sit on that until tomorrow.. because that has to be one of the last things that she (Cory) hears before the nomination ceremony. I am close to Dane and I’m aware that Dane wants Sam out. At the end of the day I want to be loyal to my buddy but the fact that he is spreading lies about Sam is not just. And you finish off with … and I have to be honest with you. He (Dane) would put up you and Kyra. Kyra goes to the washroom. Sam tells Adam – you do what you want to do. Just know that what I say is actually true. Adam – I know. I’ll talk to her. 12:10pm Dane and Esti in the file room..
1am Backyard. Sam, Kyra, Adam, Mark, Esti chatting. twitter’s a weird place where logic doesn’t apply. so i checked it out a bit this evening. scrolled down a few rabbit holes. so sam was hoh last week. talking about the boys, and needing to split that up… and the big plan was kiki, or cory. sure there was post pov talk of dane. notice: POST pov. but sam… who knew about the boy alliance still chose to target two people that weren’t members. sam: who now believes in that alliance again would still vote out a woman this week if she avoided the block. 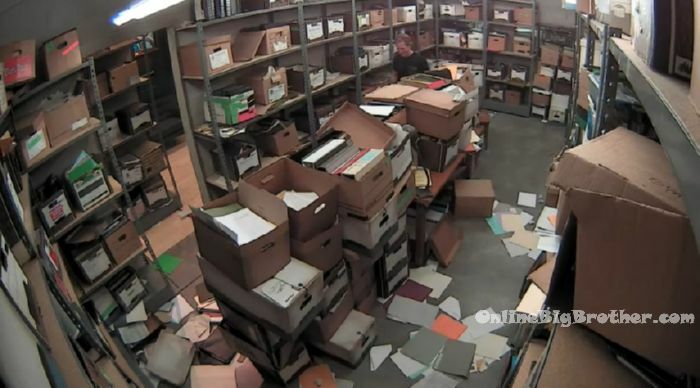 HEY SAM: wanna know how the entire cory investigation could have been headed off? 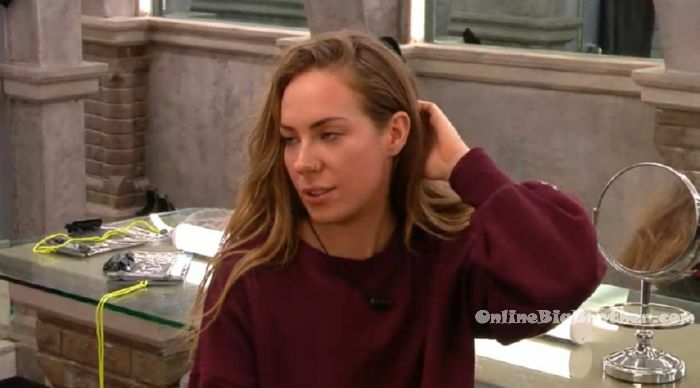 one sentence: “No Cory, we weren’t going to back door you, we were discussing who would be the best PAWN that would never leave if either nominee came off the block, Kyra just misunderstood.” if sam adam and kyra had said this thursday night. done. you’re safe. apparently i don’t do big brother right, because we’re supposed to stan a qween. even if it’s the qween of traversing excrement filled tributaries without a broad bladed pole manual propulsion device. same rabbit holes: cory is going to be so embarrassed. cory is anthony’s puppet (eyeroll, cus a week ago sam wasn’t adam’s puppet)? cory who didn’t overhear or see pb meetings twice so doesn’t have the same level of culpability in playing the boys game for them. next week when cory is on the block will we also have to butcher the english language in praising false royalty? putting a plunger on either’s head and calling it a crown does not a queen make. These guys are good (PB), I really like them. I know people hate to see an alliance dominate like them, but i’m all about good game play. Beside Mark, everyone has put a good efforts protecting the PB’s even though most of the house suspected a Boys alliance. They are getting close to the Brigade territory. Let’s see what happen next week if Sam is out. 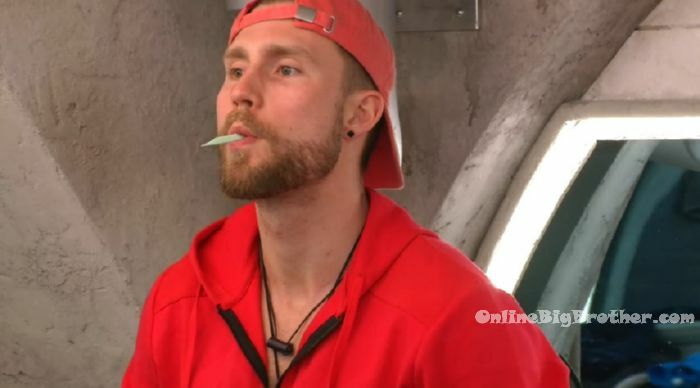 Can someone tell me why Damien knows about the guy alliance but has done nothing to make any kind of move to get an alliance of his own? I like him but it’s really unsettling he has let them just barrel through the game. He could have teamed up with the girls and did something about thm but didn’t. Damien has a low key finals arrangement with Dane. He’s had it since feeds started. if damien teamed up with the girls? which girls? sam and chelsea or kiki and este? let’s be honest. since feeds began both pairs have been privately throwing shade about the other. I suspect the boys plotted that adam and dane should turn both pairs against each other before feeds started when they were all in the alliance of 8 we never got to see meeting. Damien was teamed with Kiki and Este in a way, though mostly in the shadow of Dane. there’s no way adam was going to let damien anywhere near his parachute girls. week 2-4: damien goes to sam or chelsea about a boys alliance. what happens? they tell adam. week 2-4: damien goes to este about a boys alliance. what happens? she tells dane. week 2-4: damien goes to kiki about a boys alliance. what happens? she tells este. see above. Every time Kyra says that borderline personality is the cause of shadiness and the reason others are making Kyra a target when the reality is the shadiness was intentional deception i get very angry. Now Adam has gone to Damien to propose a boys final five (note: Adam only ever acknowledges Damien as a last resort). Anthony won’t be amused. Anthony wants Cory in that seat. Mark won’t be amused. Mark wants Kyra the toxic goat in that seat. If Sam is evicted, Adam technically got his wish. They waited until jury. Sam going to Este saying it’s too bad the girls couldn’t work together and pull a big move: a) Sam had that chance when Chelsea was hoh. She insisted the girls of “the other side” could be asked about working together subtly but not told about the boys alliance. Cory was never included in this proposal. b) Sam had that chance when Chelsea was on the block, but instead decided Chelsea was an acceptable casualty. c) Sam had that chance when Sam was the hoh. suddenly the boys alliance was imaginary. puppet say what? d) this week Sam told Dane she would vote to keep him, not Este before veto, and Este knows it. Conclusion: Yeah. too bad the girls couldn’t work together. Eyeroll. Mark won’t target the PBs until it’s the triple and he’ll purposely lose HOH this week so he stays available to win the triple. He only wants to break up the PBs if he can do it fast without needing to answer for it all week (i.e. send out two of the three guys in the matter of an hour). Likewise, I doubt Anthony will want to win (why would he when he can just sit back and dictate who goes and when). Should Anthony win though he would target Este & either put her up with Damian or Kyra. In fact, I’d be thrilled if Anthony won HOH put up two of Kyra, Este or Damian and the one who didn’t get nominated won POV and took down someone on the block. This because Anthony would then have to put up Cory (or explain to the PBs why he wasn’t!). Either way, it would be DRAMA. If Sam goes this week & Anthony pushes for her to go I maybe could see Kyra changing things up should she win HOH. It does seem like she’s all talk no action though. Kyra only aligned with Anthony thinking she would be shielded by two power couples (Cory/Anthony & Sam/Adam). If she figures out that is BS I could see her going after any two of Dane, Adam, Anthony (and maybe Mark). But it won’t matter b/c she won’t win anything. In exit interviews, Kiki indicated Este is more of a player than we’ve seen – but I just can’t see her nominating two guys. Rather I’d see her doing what Dane tells her. Presumably, that would be Kyra & Adam (though Dane would likely push her to put up Cory) but who knows. As for Damian – he might just be another dud but he has wanted Adam out for a while – if somehow he learned of Anthony’s questioning of him he might be willing to take the shot. The problem is he’d likely be influenced to put up Kyra beside any guy he nominated which would then allow the PBs to save them. This might be a week Dane throws HOH b/c he won’t want to nominate Damian or Este (and he can’t nominate Cory) so that leaves Kyra with one other player — all of which he has deals with. Adam would be the most interesting b/c I assume he would put up Este & Cory, but depending on whether he stops pouting about Sam we could see him turn on the PBs potentially (although I think he’ll just become tighter with the guys once Sam leaves). In fact – without Sam I think the PBs will be much more obvious to Damian, Este and even Cory b/c suddenly Adam will be hanging out with all the guys all day long.